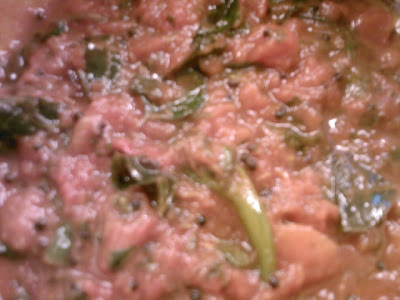 This is a simple yet flavoursome chutney which is easily prepared in minutes. It is visually appealing and is a great accompaniment to chappatis, puris and dosas. To mellow down the heat a few tablespoons of thick yoghurt tranforms this fiery chutney into a wonderful accompaniment with hot rice. 1. Heat oil, add mustard seeds, once it splutters add jeera, curry leaves, coriander leaves and slit green chillies, saute for a few minutes. 2. Then add tomatoes and let it cook until soft. 3. Then add turmeric powder, salt to taste, a touch of jaggery. Boil for a minute. 4. Remove from heat and let it cool. Serve as chutney. Or as an accompaniment for rice add a few tablespoons of thick curd.